So! We were going out for a lunch with friend and family. 'The friend' was very close buddy of the 'doc' during his med school days; however, after they left med school, never had a chance to meet again. Our plan was to go for a Chinese dim sum and after eating directly to Please Touch Museum, Philadelphia for kids. She also has a two year old, his name is Aryan (isn't that a very cute name?). Yes! Auripra made a new friend. Although, we all were going to the museum, doc had to go to hospital for something. I needed to keep that in mind while dressing for this outing. I knew, I would be running after Auripra all afternoon at the museum. I dressed myself in a very comfy outfit, also wanted to keep it trendy. Therefore, the white Bermuda shorts and chevron prints. Bermuda shorts and chevron prints are totally in trend this season. Actually, the earrings I wore also had chevron patterns on them. Products I used for makeup were sunscreen, mascara, lip-balm. I actually used sunscreen (a must during day time all year) on all over exposed skin. Click here to know what are the other styles that are in trend this spring/summer. Click here to see how I wore this same top as a fall outfit. Isn’t it great to re-wear a top totally different ways again and again? And, Don't worry about my wedge, I surely changed back into a sneaker before entering the museum! Floral print is always hit for spring and summer! You can wear it as a dress, as a blazer, as skinny trouser, as a scarf or as i am wearing as a skirt. I bought this skirt two years ago when Auripra was only a few months old. Could not wear it in 2011 summer though, because I had my preggy fat all over summer that year. First time, I wore the skirt last summer and went to Longwood Gardens for a day out with my mother before she went back to India on 29th April, 2012. Again last weekend I wore this for a casual family out with Auripra and her dad to Penn's Landing. Yes! It has been a year before I wear it again. As you have already guessed today's topic from it's name; Yes! 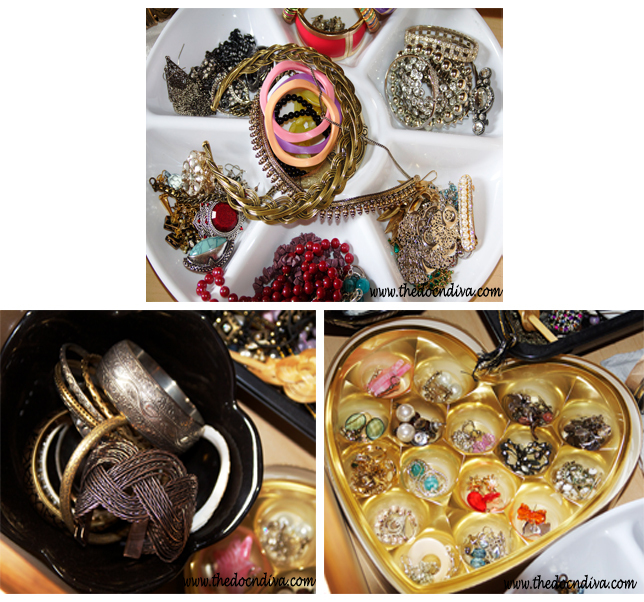 I am going to talk about 5 DIY jewelry organization ideas that I came across in Pinterest. Pinterest is my latest craze! You can 'pin' there about everything on and beyond our world. So, it's really cool and you must check it out during your leisure if you have not started pinning yet. Anyway, coming back to our topic again. DIY Jewelry organizing ideas are all over pinterest. I am going to share top 5 on my list here. Can you believe this is already May? It is still kind of cold in Philadelphia, so that is very frustrating! Anyway, in USA and many other countries, during April and May 'Spring' is not only something to be excited about! There are more to it! Yes! I am talking about "Prom"!!! It is probably one of the most memorable event of a High School senior year student. Therefore, today's post is for all of you who is going to experience that special day of your life soon. I am going to share the whole look from hair to dress to shoes to makeup to nails! So, today is another nail-art tutorial time! You already saw the picture of this nail-art last week here. Yes! The black-golden and red one. Even when I was doing the nail-art, I did not realized that it could perfect for any formal event, such as Prom etc, if you are wearing something black/golden.